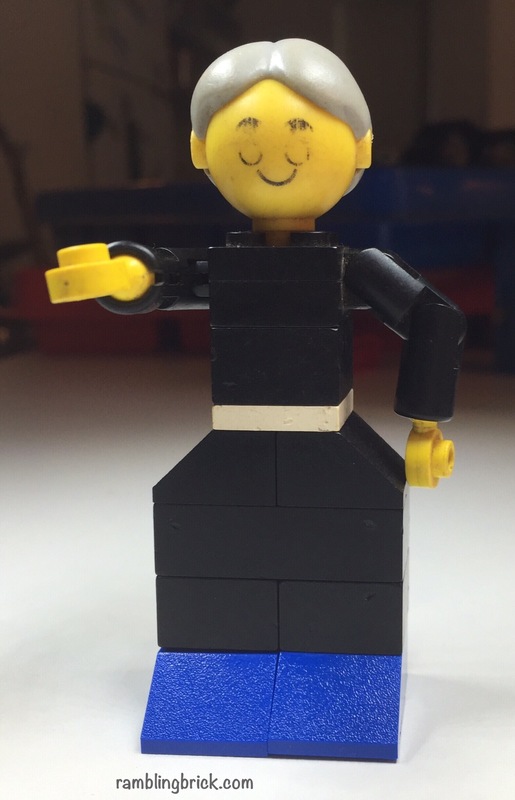 I recently took time to visit my Childhood Lego Collection, which my parents maintain custodians of in trust for my brother and I. A number of features rapidly became obvious, and I thought I would share some of the clear differences for the benefit of those of you under the age of 30. And to provoke some quality ‘when I was a younger person…’ stories as well as floods of nostalgia amongst those born before 1985. If so provoked, please feel free leave a comment below or on Facebook. Where shall we start? There are so many common pieces from’back in the day’ that are no longer readily available. The blocks and plates were there, but with an exceptionally limited colour palette. Slopes were present in red and blue, with black arriving a little later. Why not start at the bottom? Base plates as we now know them didn’t arrive until the mid- late 70’s. Prior to that we had these beauties: 10 x20 studs, and one block high. They were prone to break as they were not in any way solid. But still a great place to start a model house or vignette. 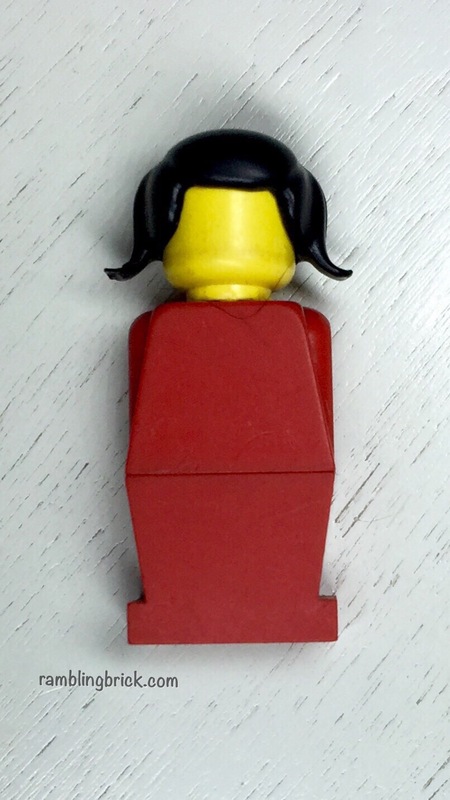 In the mid 70’s, Lego released a family of ‘home maker’ figures: brick built with posable arms. Smaller than miniland, there was a family available, with a collection of furniture. The years have not been kind, but grandma survives. The scale that we think of today as ‘Minifig scale’ didn’t exist prior to 1978. At this stage figures were the same height as todays minifigs, but had no movable limbs and blank heads. 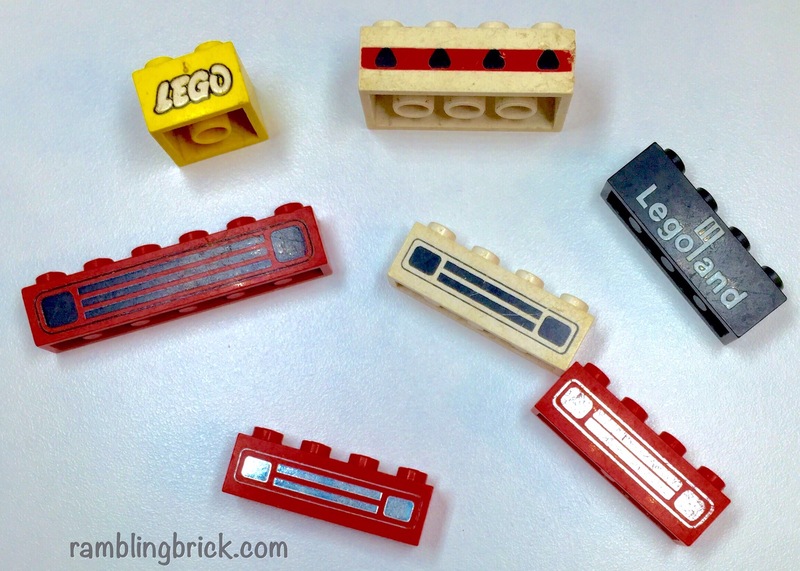 Before then, lego vehicles were almost any size, dependent on the pieces available. Micro scale to mainland scale were all options seen in the 1974 catalog. A truck could be 8 blocks high and 8 stud wide. A jet airliner 32 studs wide. A car might be 15 blocks high and 32 studs long. 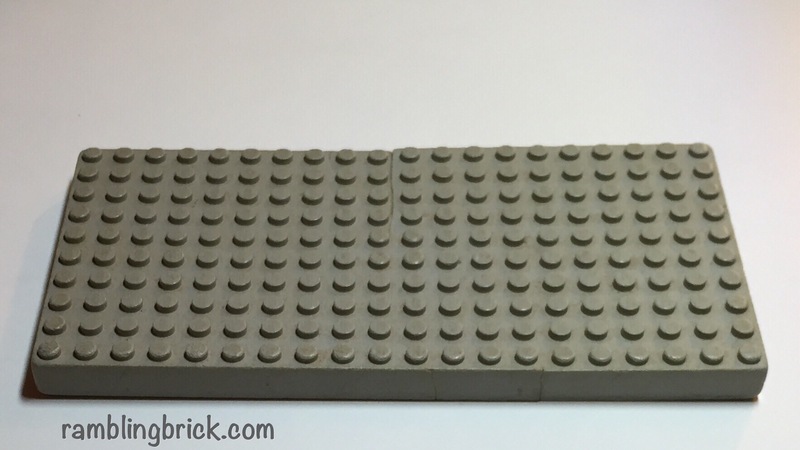 Once Minifigures arrived, a vehicle could measure 6 studs long and 2 studs (plus wheels) wide. This scale seems to have changed a little over the years, with a the smallest car of recent years (emmett’s car/ smart car) is 6 studs long and 4 wide. The scale seems to remain flexible, and has been constantly refined since then as a focus on modelling and accurate role play seems to dominate the catalog. Let’s look at the wheels. Today: wheels seem to attach either using technic style clip/rivets of either normal or a smaller scale, or a technic axle. When I was a boy, and we rode dinosaurs to school, wheels came in 3 sizes: 2 studs in diameter, 4 studs in diameter and 1 stud. The larger wheels had brass axles that would plug into a modified 2×4 brick, half way along both the short and long axis. Caterpillar tracks were also an option back at that time. 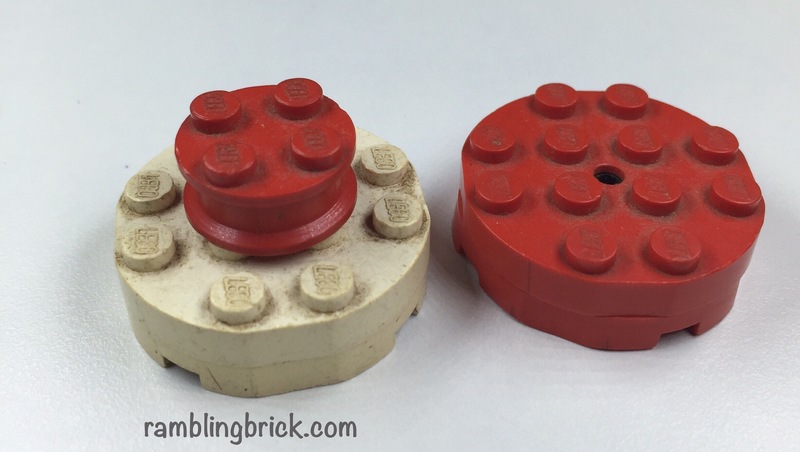 The one stud wheels were permanently attached to a modified 2 x 2 brick, rather than the more contemporary plate. There was even a double width tyre, for the trailer on the lorry. 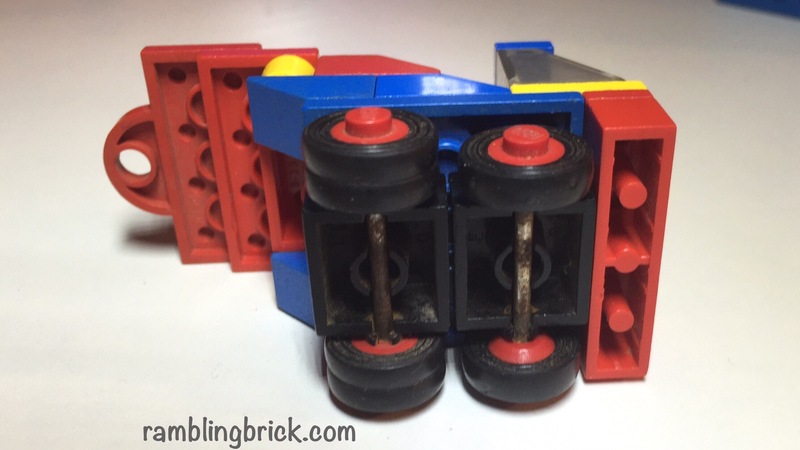 Looking back, as well as the now classic Headlamp/washing machine/ehrling brick, a wheel in the axle brick makes for an easy SNOT technique. Shame I didn’t think of it back then. Turntables are far more streamlined today, compared to the earls 1070s. They do not pull apart as current turntables can. They did, however, have a hole in the centre, that would allow the axle of a wheel to fit in it. (voila, can you say ‘instant wedding cake’). Gears Tragedy in the rambling brick shed: I cannot locate my ‘old school’ large cog. But before technical sets arrived, we had these brightly coloured cogs that would mesh on almost any angle, white axles and red bushes. There was a universal joint, and functionally almost identical to the subsequent technic piece. 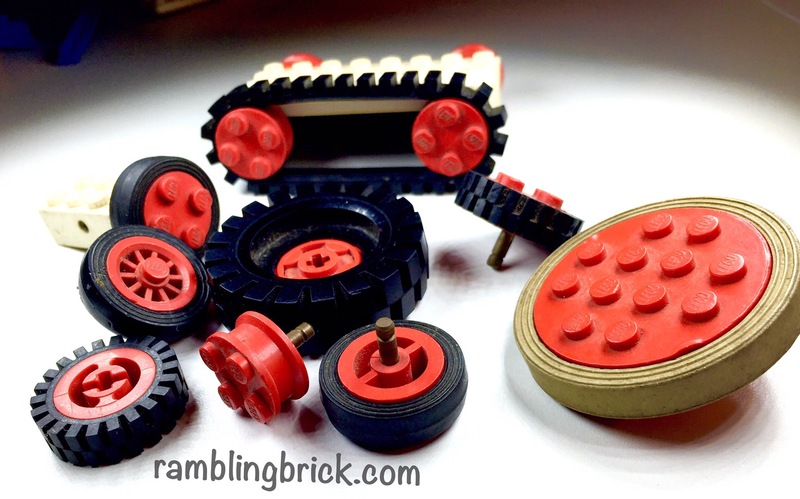 There were also tyres for the small red cogs to fit into for that jaunty off road look. 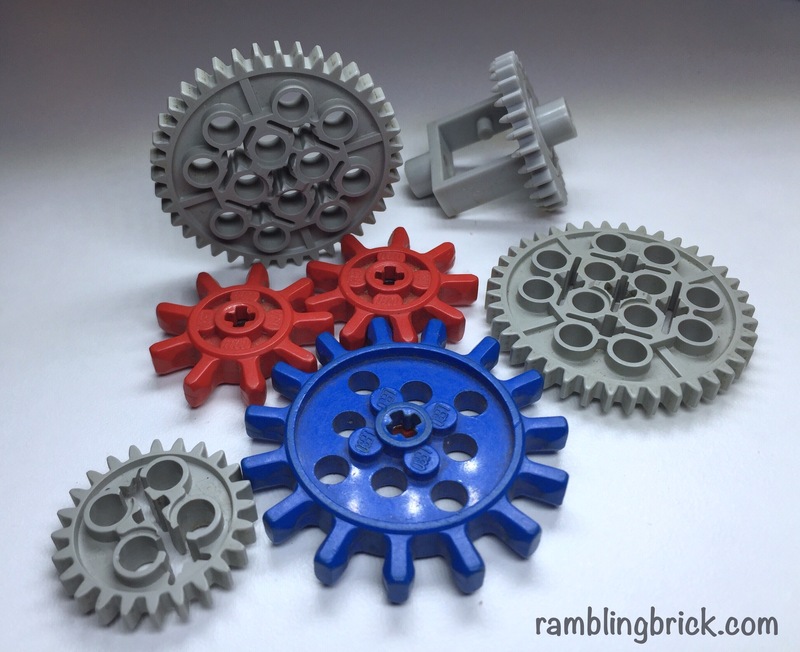 You can see that the new technic cogs fit many more teeth into the same diameter space, allowing greater gearing up or down. In the early 70’s there was one option for your railway: 4.5 volts. The rails were blue. The rails were independent of each other, held together at whatever width you wished. The catch was that there was an inner and outer radius for the curves. The straight rails may come in useful later in the year when the Friends roller coaster set arrives. 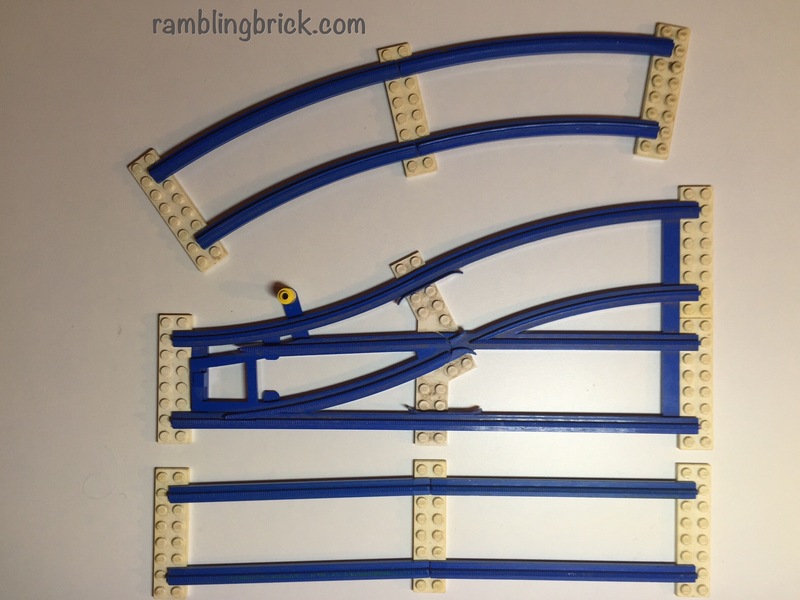 With a spacing of 4 studs, there are curved rails and straight rails that run up/down a slope, but none that are flat. These old school rails could be quite useful then. The motor had 4 drive sockets, and wheels with a flanged shaft could plug into and not slip. Later models worked better with normal wheels. The Technic motor signalled the beginning of small gear mobility. Unfortunately mine have been lost to the mists of time. Power cords started as relatively disconnected ends, followed by closely connected cables. There have since been several iterations of the ‘plate style’ power cable. There was a seperate battery car for the train – the level could hit a pole by the side of the railway, that would cause the vehicle to change direction (as long as it was moving quickly enough.) A button underneath the battery car enabled a signal to stop the train (admittedly after the engine had already passed! Stickers remain a controversial subject. Many AFOLs are reluctant to place stickers. We have a number of sets from around 2008 that had there stickers placed, but they have, rather disappointingly, started to feel and blister. But look at these stickers: if you wanted national flags, you got solid flags, and stickers to place on them. After 35+ years, they are still intact, as are the stickers placed on the tabards of these 2 construction workers (~1980). Admittedly they have taken on a bit of dirt, and worn down a little around the edges, but no bubbling! Take that Spongebob! 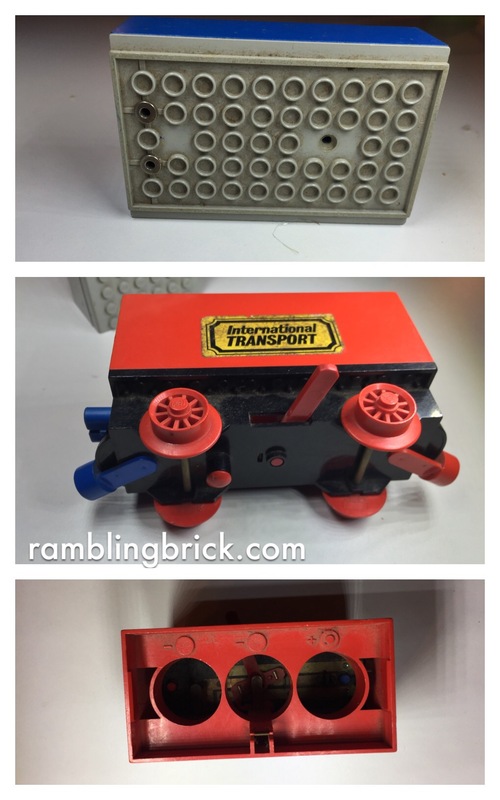 These were far more common back in the day, with both branded bricks, and details such as vehicle grilles. Some would argue that these pieces were far more specific use than the pieces used for vehicle grilles today. There were a couple of changes in the design of windscreens, from the ’empty sloped block’ -2x4x2 to a ‘wrap around’ model that arrived much later. Also… the polycarbonate doesn’t age well – the once clear pieces are certainly becoming more and more opaque. Perhaps it’s chemical deterioration. Perhaps its all those times we rummaged through the box to find that piece we needed. This is not a comprehensive look at lego through the ages. It’s just a quick glance at some of the pieces left from my childhood. What pieces from the past to you miss most of all? 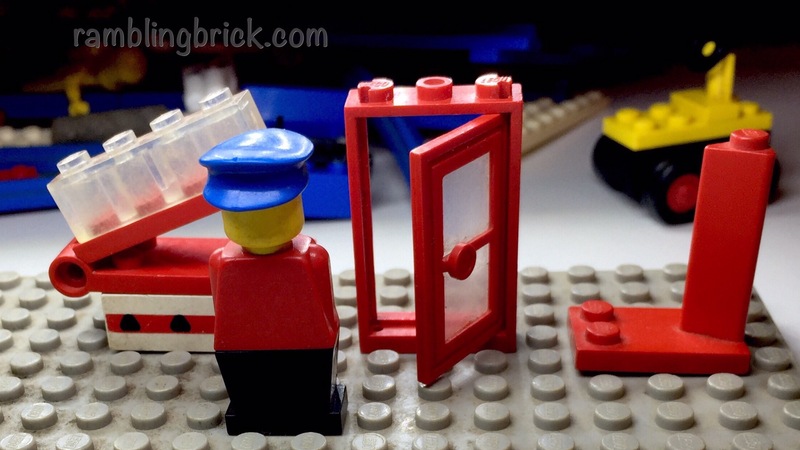 Nice article – a lot of the changes where due to higher volume and people doing more Mocs and using almost every single part – printed bricks are great but if you are into making your own thing printed brick just get used for the purpose of the design print. Like car head lights etc. I do think is a shame that the stickers don’t last as long but that’s the difference between paper and acrilic – on the plus side you can wash the new sticker without too much damage comparing to the old paper ones. Wheels and tyres yes I misse the old ones they were heavy and sturdy – you could play rough with them and they wheels wouldn’t come apart now simple wheels they come out as easy they are put back in. I do miss a lot of part that they will be really useful now a day like smaller doors , hinges and some of the other articulated pieces that will be nice to have back. Thanks for your thoughts Aussie Brickster. The printed grills made for a quick and easy build, but did mean that almost all cars and trucks looked the same – certainly not how it goes today with the mixture of trans plate/tiles and hanging brackets. 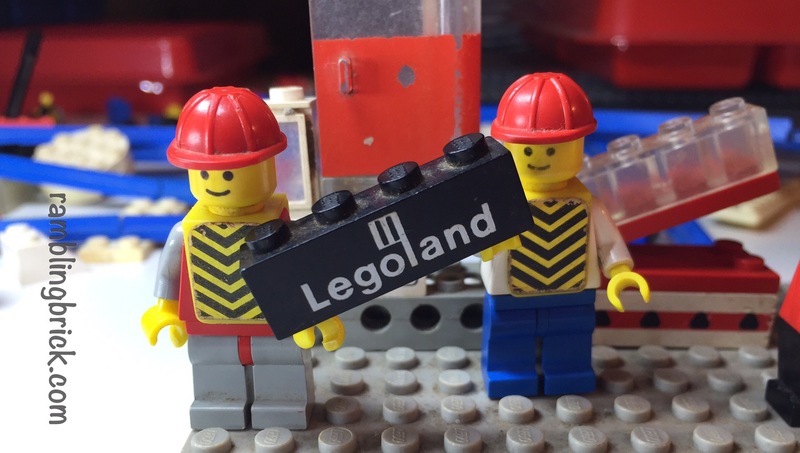 Certainly lego has evolved over the last 30 years – initially primarily a construction system, it is now more a modelling system. What do you think? Yes exactly – no a days with all the new parts now we can aim for a more organic look – more curves and angles – rather than plain brick and slopes. Now guns have rivets , grooves and even textured handle – they are looking more and more to brickarms or similar. 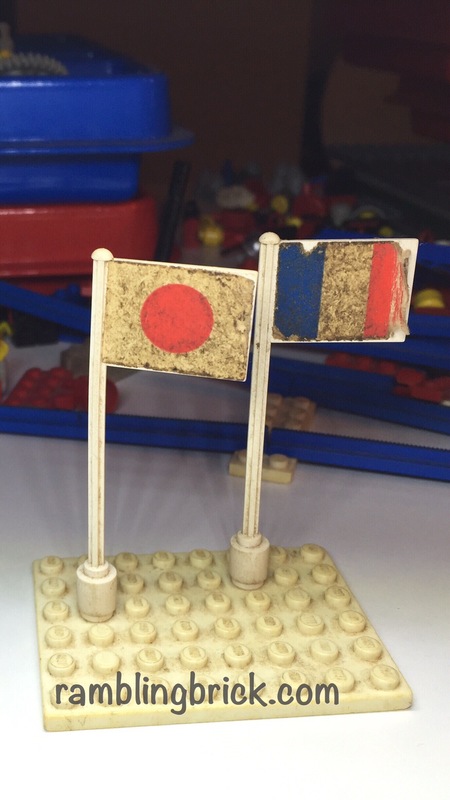 If you got a pile of LEGO from the 70’s and placed it next to a pile of random parts from more recent times, the most obvious change is immediately clear – the colour palette and mix. The original basic colours are now relatively rare whereas that was all there was back in the 70’s. I think the other biggest change is that the introduction of the minifigure and then themes in the late 70’s meant that LEGO became over more focussed on sets that built a specific item. Prior to that there were lots of basic parts kits, but even the sets were little more than a marketing idea to get you to buy more of the same parts. These days, the market is almost entirely sets and in order to make them ever more realistic the parts have had to become increasingly more specialised. At the end of the day, what drives the change is the desire to sell more product.